This is a model of the Mil Mi-6 (Hook), a heavy twin-engine transport helicopter. The Mil Mi-6 was a Russian made heavy-lift twin-engine helicopter built in many variations. The most common type of it is probably the transport version with short wings that were dismounted when it was used as an aircrane. But it was also available as firefighting helicopter, passenger transport helicopter and flying command post. It's rotor-gear was also used for the Mil Mi-10 helicopter and the V-12, a prototype and the largest ever flown rotary wing aircraft. 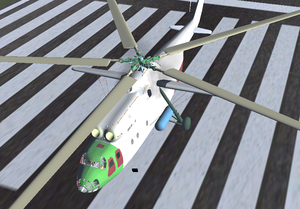 Later the Mi-26 was built on the basis of the Mi-6. The Mi-6 itself set several world-records for speed and weight-height lifting. In all it's versions it was built about 800 to 900 times and sold to nearly all countries that where friendly or part of the soviet union as well as some African countries. Currently there is just the common transport version with short wings modeled for FlightGear. Current Version 4.0.2. You can follow the discussion on the forum. This project is published under the creative commons license with the conditions Attribution, Share Alike and Non-Commercial. Start up the engines by opening the red box in the overhead panel and click on the switch, middle mouse click will shut down the engines. Set the Reference Compass at the engineer panel, magnetic variation is shown as tool-tip, set needle to marker position. Altitude and/or pressure settings in the Altimeters in inHG, mmHG or hPa (as tool-tip), the Autopilot will work with this values (not with the HUD-infos). Check cargo and/or payload: press y to switch to the towing control and open the red box, for loading cargo (elephant) and/or paratroopers. The Autopilot in the cockpit will control most of your flight, do not use the generic one or mix them together. There is a wheel for Rotor-Tilt: -5 is for high speed, +5 is for backwards flight, 1,88 is a good value for normal take off, you may control your speed with it. There is a wheel for Rotor-Roll-Tilt: -5 is for high speed, -0,62 is for backwards flight, -1.25 is a good value for normal take off, it is very hard depending on the Rotor-Tilt, so be careful! There is a wheel for Floating-Pitch: this is a full automatic vertical hoovering control for landing and starting, -5 is about 450 cm per second down, +5 is 450 cm up. Be aware of the ground effect, a Floating-Pitch of -3 lets you descent but not land, you will hoover around in 2-5 meter high, finally set it to -5. There is now a new wheel for controlling the tail horizontal stabilisator from -0,30 to +0,30. A value of -0,15 gives you the maximum speed, be aware that if your speed is to high you may lost control. In all flight situations the Coup (rudder-trim control) should be active. Use the rudder to set your heading in floating conditions. For more speed than 90 kt the elevator-trim has to be at the top (+1) position, with a rotor tilt of -5 and rotor-roll-tilt: -5.0. You will get 160-180 kt speed then. Use the elevator-trim to reduce the speed before approaching or let this be done by the IAS, then change to Floating-Pitch control and use only the rudder for heading and rotor tilt for speed control. For additional comfort the HUD will show you the values of the controlled axis and some more information. Some instruments will show you metric values, some ft/knots. On the very left side you have a panel with 5 green lamps, the lower 3 are for trim-neutralisation, used after the Autopilot is disabled. The upper two you may press to get the latest METAR info on screen. - Heading Control: Heading Bug (HDG) is to set in the HSI (Horizontal Situation Indicator (with 4 green markers). - Velocity Control: Speed with Pitch are set in the Speed Indicator, push IAS and turn needle (left from HSI), do not use for speed below 70 kt. - Pitch/Attitude Control: pitch and altitude wheels changes values. - Wing leveler is active when you push the AP button, it is also the AP activating/deactivating Button. - APRP is used for intercepting the Glide Slope. - GPS for flying routes from the Route Manager. - ALT is holding your attitude. - ILS/NAV is activated by the left MP-Kurs radio in the engineer panel. For ILS Landing you may use the HSI, it gives you the indication that ILS and/or Glide Scope is intercepted (if not, red flags coming up). ILS heading works even far out the stream, for the glideslope you should wait till the indicator is in nearly horizontal position (yellow line). There are 3 Altimeters: the left one is electrical and gets the information from Radio or GPS signals, in meter and mmHG, the upper one is in meter and mmHG, a tool-tip shows you the Value in hPa, the lower one is in ft and inHG, they are connected and you should set them to the ATIS information of the airport before starting or landing. The compass is cleared of the magnetic variation if you set the reference compass in the engineer panel to the orange marker position. On top of the horizontal heading indicator (HSI) is a white scale, it will show you the wind drift derivation. There are indicators for Flares, over-loading and parking brake. Besides the starter switch is the switch for rotor brake on and off. Paratroopers can be set up in the payload menu, each is 120 lb, they need a open back door to jump out, use the switch on the panel to give the signal :) An Elephant is waiting to go back to Africa, press y to go to the towing control. A red lamp shows you the activ elephant, clicking on it deactivate it. You find some instruments in this additional ramp-panel, the middle instrument is for ground- and air-speed with a switch on the bottom. There is a warning light for overload (sign: BEC). In the navigator seat you may control a water canon, implementation of deleting wildfires and crashes is working now. You may create a fire by holding Strg+Shift and click on the ground. There is also a switch for a water-pipe, to load water from a lake or the see. Go into floating mode and descent to 25-28 ft, and hold this altitude with a floating pitch of -0,35. When loading water you have to adjust this setting to +1.00 or more, depending on the weight of water. You may fill up to 10000 liters. In fire fighting situations you will get all information in the cockpit from your friendly copilot. To install the addon for this, read the txt-file in the read-me-for-wildfire folder and install the files. All animations are working in MP-mode. The engineers of the Mil design bureau used two Soloviev D-25B gas turbines to power the giant main rotor. Each of those engines produces 4100kW takeoff and 3505kW nominal output. Their air intakes are equipped with electric deicing. To lift the 27 tons of helicopter plus up to 15 tons of cargo (Variant Poschar up to 20 tons of cargo) you don't just need strong engines but also an appropriate main and tail rotor. Appropriate in this case means that the 5-bladed main rotor has a diameter of 35m and turns at about 120 rpm. The resulting circumferecial speed is about 220 m/s. That does of course produce a lot of torque which needs to be counteracted. Therefore the Russian engineers mounted a massive four-bladed tail rotor of 6.3m diameter at the very far end of the helicopter in about 7m height. Both rotors have electric deicing equipment. The Mi-6 helicopter has two auxiliary wings mounted high over the center of the fuselage. They are tilted upward to the front and provide up to 20% more lift at cruise speed. However they get in the way when hovering, so variants of the Mi-6 helicopter that need to hover a lot, like the fire fighter, often have no auxiliary wings. The principal electric circuit runs with 27 volts DC and is fed by two 12kW generators and a battery that ensures 30 minutes of autonomy in an emergency situation. There is also a three phase 360 volts (400Hz) AC circuit on bord for operating the radios and the deicing equipment. This cirquit is fed by two alternators of 90 kVA each. The helicopter also features an auxiliary power group with an AI-8 gas turbine powering a generator of 24 kW. The auxiliary power group ensures that the engines are supplied with enough power for start-up. This page was last modified on 28 December 2016, at 22:20.